Our FAQ contains answers to many common Strea.ma questions. If you can’t find the answer you’re looking for, please contact us directly. What do I need to start using Strea.ma? You just need a web browser and an Internet connection. To show Twitter content, you’ll need to log in with your Twitter account. To show Instagram content, you’ll need to log in with your Instagram account. And if you want to show content from Facebook pages, you’ll need to be an administrator on those pages. Strea.ma is optimised for mobile devices, so you don’t need to be sitting at a computer to get started. To show Strea.ma on a big screen, read ‘How do I show Strea.ma on a big screen?’ (below). If you’re using Strea.ma for an event, make sure you try Strea.ma out on the screen or projector you’ll be using – before the event starts! How do I show Strea.ma on a big screen? No matter your budget or technical expertise, it’s easy to show Strea.ma on a big screen or projector. Strea.ma is supported on a range of display options, ranging from full-fledged digital signage solutions to smart TVs to the good old ‘plug your laptop into your TV’ approach! For dedicated digital signage solutions, we recommend TruDigital and ScreenCloud. These systems are cloud-based, feature-rich, very cost-effective, and feature Strea.ma in their app stores. There are a number of small devices that turn any HDMI display into a smart TV. We recommend Airtame (http://www.airtame.com). It’s powerful enough to run Strea.ma, it saves you from needing to plug a computer into the display, and you can stream the display from your computer or mobile device. WARNING: Some devices (e.g. Chromecast) scale the display resolution down to 720p when you mirror your device, so Strea.ma will revert to its mobile-optimised view. This might not look so great on a big screen. If you have a smart TV with a built-in web browser, you can show Strea.ma directly on the TV. If you have a ‘dumb’ display, the easiest way is to plug your computer into your display with a VGA or HDMI cable. Then you just need to navigate to your stream’s public URL in your device’s web browser. Simple! Find out more on our Devices page. What web browsers and devices does Strea.ma work on? We support all modern smartphones and tablets including iOS, Android, and Windows Phone devices. We always use best practices to meet industry standards for web development and we do our best to ensure that Strea.ma will be functional on all mainstream platforms. However, because of the increasingly large number of web accessible devices available, we cannot guarantee that Strea.ma will look identical from one device to another, and the user experience of Strea.ma may change to best fit the viewing platform. As a standard practice, we support the current and previous major releases of Chrome, Firefox, and Safari on a rolling basis. Each time a new version is released, we’ll begin supporting that version and stop supporting the third-oldest version. We support Internet Explorer 11 but we do not support any previous versions of Internet Explorer. Microsoft has ended support of their older browsers on any platform newer than Windows 7. If you require legacy Microsoft support, please let us know. How do I get Instagram posts showing up in Strea.ma? First of all, you need to connect your Instagram account to Strea.ma. You can connect your personal Instagram account as well as an Instagram Business account. If you connect a personal Instagram account, you can only show content that you have posted on Instagram. If you connect an Instagram Business account, you can also show updates from other Instagram users that match #hashtag searches. Due to Instagram’s API restrictions, Strea.ma is unable to search Instagram posts by @username. This means that you cannot search for Instagram content from other users by their @username. This restriction also means that you cannot block specific Instagram users, because Strea.ma cannot identify individual Instagram users. Instagram now also restricts the number of requests we can make per hour, so occasionally there will be delays in showing Instagram content. How do I get Twitter updates showing up in Strea.ma? First of all, you need to connect your Twitter account to Strea.ma. Your own Twitter updates and retweets will show if you check ‘Show my personal Twitter updates’. Strea.ma also shows tweets from other users that match #hashtag or @handle searches, i.e. within the text of the tweet. Please note that you’ll only see other users’ tweets from within the last 7 days. How do I get Facebook updates showing in Strea.ma? First of all, you need to connect your Facebook account to Strea.ma. Your personal Facebook updates will show if you check ‘Show my personal Facebook updates’. Strea.ma can also show posts from Facebook pages. If you want to show content from Facebook pages, you’ll need to be an administrator on those pages. Strea.ma shows every post from your Facebook page, as well as posts to the page from other people (PLEASE NOTE: Strea.ma won’t show posts from people who have locked down their privacy settings). Can I use Facebook #hashtags? No, you cannot search Facebook posts by hashtag as Facebook does not allow external applications to use this feature. I've set up a stream but nothing is showing. Why not? Twitter – Public content for hashtags and handles will go back 7 days. Your own content from the account connected to Strea.ma does not have this time limit, so it should all be available in your stream. Instagram – Public content for hashtags will go back 24 hours. Facebook – There is no public hashtag search available for Facebook, but your page and personal content has no time limit, so all historical content should be available. Why are some Instagram posts not appearing in my stream? Instagram restricts the number of requests we can make per hour, so occasionally there will be delays in showing Instagram content. Why are some Facebook posts not appearing in my stream? Strea.ma and other external applications are affected by the privacy settings of people and pages on Facebook. Strea.ma can only access Facebook content if your page is public and the users posting there are making their posts public. Why are some tweets not appearing in my stream? Strea.ma does not display retweets from other users (otherwise the screen would fill up with lots of copies of the same post!). Strea.ma only shows other users’ tweets from within the last 7 days. As soon as fresh Twitter content comes in, Strea.ma will show it. Very occasionally, some tweets just don’t get shown. This is because Strea.ma uses Twitter’s search API and Twitter does not index absolutely every tweet in its search results. Can Strea.ma show video posts? No, Strea.ma doesn’t currently support video posts. But this is coming soon! How do I embed Strea.ma in my website? Just copy the embed code from your stream’s admin dashboard. Then paste it into your website (or give it to your web designer to do it!). You can make your stream suit your website’s colours, and you can choose whether or not to show the stream’s hashtags to your visitors. The embedded stream is responsive, so it will shrink to fit any screen size or position in your website’s layout. How does my audience know what hashtags to use? Strea.ma offers you an optional sidebar with the hashtags, handles, and Facebook pages that your audience need to use to make their content appear on the screen. Strea.ma can also show a pop-up audience interaction message with your hashtags, handles, and Facebook pages. How do I remove the navigation and toolbars at the top of the screen? Just click the Fullscreen icon at top right. If you’re using Safari on a Mac, please note that the browser itself might not go fullscreen. This is a limitation of the browser, so try using Chrome or Firefox instead. And if you’re using Internet Explorer on a Windows machine, you’ll need to hit F11 to make the browser go fullscreen. How do I switch between display modes? Just click ‘Views’ in the header of the page and choose your preferred layout. Does Strea.ma store all the social media updates from my event or campaign? No, Strea.ma does not store all the social media updates from your event or campaign. Your stream can store a maximum of 200 updates. This is to keep it nice and fast. If you want to keep your best social media updates, you can use the Strea.ma ‘Pin content’ feature (see ‘How do I keep the best updates in my stream?’). There are curse words in my stream. How do I get rid of them? Sometimes social media users get their potty mouth on and it can be a bit embarrassing to see rude words appearing in your stream. That’s OK – Strea.ma has a filter for updates containing profanity and blocks them automatically before they become visible in your stream. You can also add words to your own blacklist to hold posts for approval, or block from your stream completely. How do I remove updates from my stream? If you have Strea.ma on a big screen at your event, you can moderate the updates in real time from a laptop or mobile device. Just like a remote control! First of all, make sure that the device that is showing Strea.ma on your big screen(s) is showing your public stream. Then, on a second device, log in to Strea.ma and select ‘Moderate Posts’. You’ll see a delete (x) on each update. When you delete an update, the public display on the big screen will update within seconds and the content will disappear. This way you can delete any updates from your stream as soon as they appear. Our built-in profanity filter catches a wide range of curse words and flags inappropriate content in your admin screen to make it even easier for you to moderate. How do I keep the best updates in my stream? ou can use the Strea.ma ‘Pin content’ feature. How do I get to pick and choose what updates show in my stream before they appear on the screen? Strea.ma offers Manual Approval Mode, where you can decide to block all your stream’s updates and choose just the ones that you want to appear on the screen. On your moderation screen, each update has an option to approve or delete. When you approve an update, the display on the big screen will update within seconds and the approved content will appear. How do I block an annoying user from posting on my wall? Strea.ma features user blocking. Simply go to the ‘Moderate posts’ screen and you’ll see a ‘Block user’ icon next to each post (except for Instagram posts – see above). If you click this icon, this user will be added to your blacklist and all their future posts will be blocked from your stream. You’ll also be prompted to report the user to our moderators. We recommend that you report any users who are abusive or post inappropriate content. Our moderators can then block them from all Strea.ma displays. This way, all Strea.ma customers can benefit. If you accidentally block the wrong user, don’t worry. You can undo it by editing the blacklist in your stream settings. Can I add my own event's logo to Strea.ma? Yes, you can customise the look and feel of your stream. You can upload banners and background images to ensure that your stream is totally on-brand. Make sure you try out your banners and images during your free trial! What format should I use for my banner and logo images? Can I change the fonts and colours to match our branding? Yes, you can change the text colour and link colour, so your stream can match your brand or event colours perfectly. Our font picker uses Google Fonts. There are hundreds of fonts available (you can find out more about Google Fonts here). Can I add my own custom CSS to override the default styles? 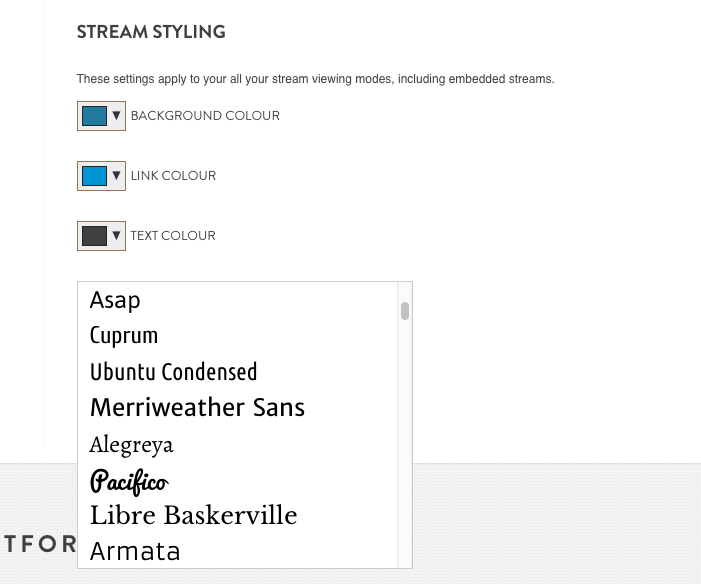 Our Premium and Enterprise plans feature ​Custom CSS, which allows you to customise your stream’s appearance by overidding Strea.ma’s default CSS styles. If you would like to discuss opportunities for a white label offering, volume licensing, and any other business development topic, please send an email to info@strea.ma. How much does Strea.ma cost? Our plans start at US$119 per month. We also have a free trial that you can use to see if Strea.ma is right for you. Read all about our plans on our pricing page. How do I make changes to my paid plan? Can I cancel my paid plan if I don't need it any more? Yes, absolutely. You can cancel your subscription at any time. And if you’ve got another event coming up, you can reactivate it by logging in and upgrading to a paid plan. You can do this through the account settings page in your Strea.ma dashboard. Can I use Strea.ma in my country? Yes, there are no restrictions on where you can use Strea.ma. We have customers all around the world in over 50 countries. Can I get a VAT invoice from you? No. As a New Zealand company, we do not have a VAT number and we do not issue VAT invoices. Yes. We use Chargify, PayPal and Braintree for credit card processing to achieve full PCI DSS compliance. We also accept payments for annual subscriptions via international bank transfer.